Mountain Dew Kickstarts the Morning! Mountain Dew wants to energize us – especially in the morning hours. The soft drink product from PepsiCo company has long been known for its high energy commercials and sweet taste, and now it is launching a new soda geared specifically to the morning crowd. The company’s loyal fans have long mixed Mountain Dew citrus soda with juices for unofficial morning pick-me-ups. And this past summer, Taco Bell introduced a blended Mountain Dew and Tropicana orange juice drink to go along with the company’s new breakfast menu. The new product is on the market now in two different flavors – Orange Citrus and Fruit Punch. 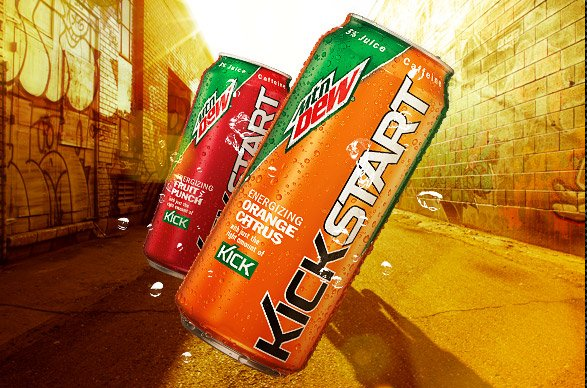 Kickstart has 5% fruit juice with a large helping of caffeine and has only 80 calories. The integrated campaign will include television, radio, product placement, social media, and a five-month sampling tour to give away more than 2 million units of the new beverage. Using a theme of “Dawn Patrol” linked to social media tactics, the product is “for all those who get after it early and often. The first ones to the surf spot. The ones leaving fresh tracks down the mountain. For every one who believes that daylight is a terrible thing to waste. The Dawn Patrol Report is your story.” No more sleeping in during daylight hours! Poll students – how many drink Mountain Dew now? When do they drink it? Do they mix it with other flavors or drinks? What is their reaction to the new drink? Bring up the product’s Web site: http://www.mtndewkickstart.com. What are the elements and messages? Discuss the elements of the commercial: target market, key message, appeal (emotional vs. rational), elements of the advertising campaign. How will this new product compete with other soft drinks and energy drinks?